HOT SPRINGS – In becoming a 2017-18 Arkansas School of Innovation, Clarendon High School vowed to create a culture in which the focus is on individualized learning plans for students. In their application, school officials wrote: “Clarendon School of Innovation will allow teachers to accommodate and meet the academic, emotional, and social needs of every child through a personalized learning environment. We will be able to create individual pathways of success for all students. “The focus of learning will be the student, not the instruction nor the teacher. Students will be involved in decision-making, and instruction will focus on skills and practices that enable independent problem-solving. We will provide the means to break the cycle of poverty for students from low-income families while simultaneously being able to challenge our gifted and talented students. 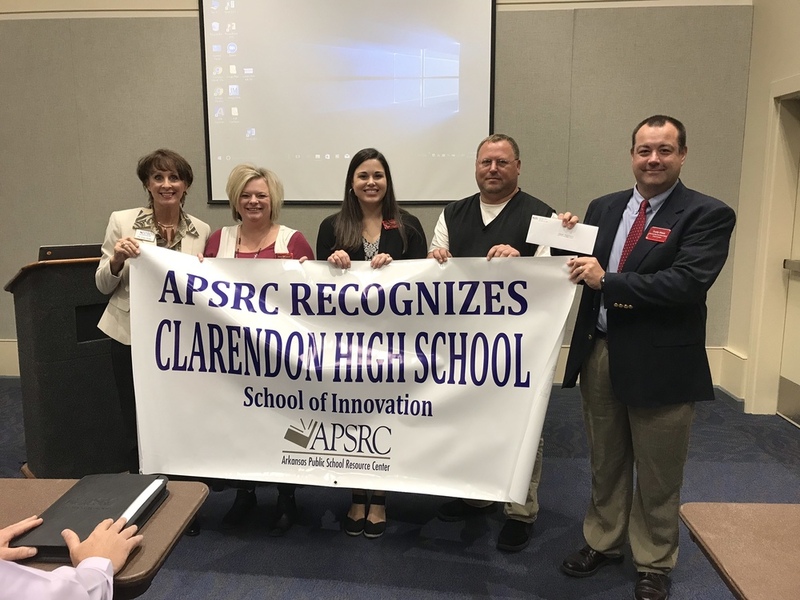 Last week, Clarendon High School received a $28,000 grant from the Arkansas Public School Resource Center to help it realize its goals. School officials received their check at APSRC’s annual fall conference, which is attended by educators from across the state. They also participated in a panel discussion with other Schools of Innovation that received grant funding from APSRC. Dr. Lisa Todd, the Director of Education for APSRC commended this year’s schools for seeking creative and innovative methods to better accommodate the needs of their student populations.